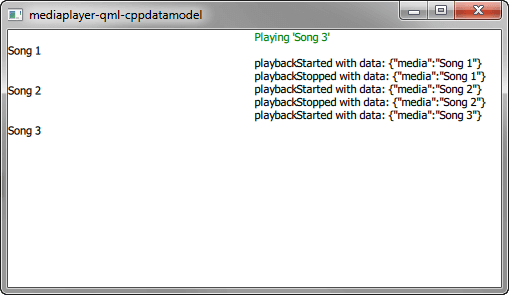 Media Player QML Example (C++ Data Model) demonstrates how to access data from a C++ data model. The data model enables writing C++ code for expr attributes and <script> elements. The data part of the data model is backed by a subclass of QScxmlCppDataModel, for which the Qt SCXML compiler (qscxmlc) generates the dispatch methods. The UI is created using Qt Quick. QScxmlCppDataModel derives from QObject, so we add the Q_OBJECT macro in the private section of the definition, right after the opening bracket. We then place the Q_SCXML_DATAMODEL macro after Q_OBJECT. The macro expands to the declaration of virtual methods, the implementation of which is generated by the Qt SCXML compiler.